The VA considers terminating its patient scheduling contract with Epic and Leidos in favor of buying a similar system from Cerner. 3M will acquire MModal’s physician documentation technology business for $1 billion. Epic’s 75-year-old CEO Judy Faulkner tells The New York Times that she will probably never retire, but has instructed shareholders that when they choose a new CEO, they should replace her with an Epic software developer. GE firms up plans to spin off its healthcare business via an IPO. Teladoc’s COO/CFO resigns over an incident in which he shared stock trading tips with a Teladoc employee with whom he was having an affair. Livongo hires former Cerner President Zane Burke as CEO. HHS OCR issues an RFI for help reviewing how HIPAA impacts data sharing, how long it takes for patients to get copies of their own medical information, and how often providers refuse to share PHI for treatment purposes. Change Healthcare acquires the API and blockchain assets of interoperability vendor PokitDok. FDA names Flatiron Health Chief Medical Officer Amy Abernethy, MD, PhD as principal deputy commissioner. A federal judge in Texas rules that the Affordable Care Act is unconstitutional. A reader tells me that industry long-timer and friend of HIStalk Ford Phillips of River Bend Marketing passed away this week in Cape Girardeau, MO at 73. 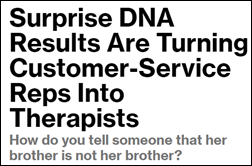 Customer service reps for consumer DNA testing companies are finding themselves in the awkward position of shocking customers with news that their sibling doesn’t share the same parents, that their child was fathered by someone else, or that their DNA matches that of a previously unknown family member. Ancestry.com prepares employees with a months-long training program that includes role-playing and empathy. 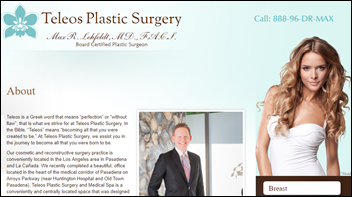 A woman settles for $1 million her lawsuit against a plastic surgeon who she claims implanted an unapproved breast reconstruction device that injured her, then falsified her paper medical records to make it look as though she had approved. The doctor had been paid nearly $500,000 over five years by the device’s manufacturer and owns company stock. Researchers analyze Sweden’s national cardiac patient database to find that while heart attacks happen more often in early mornings and on Mondays, the year’s peak happens at 10 p.m. on Christmas Eve. The study, along with others, finds that heart attack incidence rises during the week between Christmas and New Year’s Day, perhaps due to the stress caused by money issues, family gatherings, and increased consumption of food and alcohol. 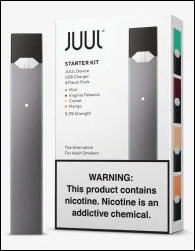 Cigarette maker Altria will pay $13 billion in cash for a 35 percent state in vaping vendor Juul, valuing the three-year-old company at $40 billion. $2 billion of the sales price will go to Juul’s 1,500 employees as bonuses (that’s $1.3 million each, although individual payouts will be based on years of service and shares owned). Juul, which had vowed to make cigarettes obsolete, will benefit from Altria’s legal and marketing muscle as it tries to avoid FDA crackdowns on what some experts say is the top public health crisis in teens. Altria is also diversifying its declining tobacco business by making investments in cannabis and beer manufacturers. 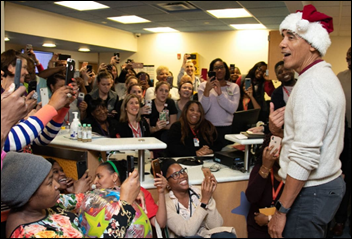 Former President Barack Obama visits Children’s National hospital to sing Christmas songs and give gifts to children. He also thanked employees for working over the holidays. Tablet-based EHR vendor DrChrono raises $10 million in funding. The VA is considering terminating its $624 million Epic-Leidos patient scheduling system pilot project and buying a similar system from Cerner. CMS issues an RFI asking for feedback on whether or not the consulting practices of hospital accreditation agencies like The Joint Commission pose a conflict of interest. An exposé on Babylon Health finds that, despite raising $85 million and convincing the NHS to use its chatbot-powered diagnosis app, its software wasn’t tested anywhere else and didn’t work. 3M will acquire MModal’s technology business – most notably AI-powered physician documentation technology — for $1 billion. MModal’s transcription, scribing, and coding services are not part of the deal. 3M will remain an MModal partner in that business, which generates $200 million in annual revenue. 3M’s health IT offerings under 3M Health Information Systems include clinical documentation risk assessment systems. The sale is just under the entire price paid for MModal by private equity firm One Equity Partners – JP Morgan Chase’s private equity arm — in 2012. The vendor filed for Chapter 11 bankruptcy in 2014, reporting assets of $626 million and liabilities of $852 million along with declining sales, but emerged from Chapter 11 later the same year. The acquisition price represents 10 times annual adjusted EBITDA. 3M will bring over 750 Pittsburgh-based employees of MModal. We are actively communicating with our customers regarding MIPS reporting capabilities. It is important to note that Greenway Health is not ending development for Prime Suite and is not forcing customers to move to another EHR. Customers can remain on Prime Suite and take advantage of future upgrades, as well as consider other Greenway solutions and services that drive practice success. We are continuously partnering with our customers to determine the path forward that best meets their needs. GE shares rise on the news that the struggling company will continue with plans to spin off its healthcare business through an IPO that will likely take place next year. A paywalled piece in STAT looks at the shaky ground IBM Watson is experiencing in several hospitals in China. The company announced in 2016 that 21 facilities would adopt the cognitive computing technology for oncology as part of a multi-year arrangement with Hangzhou CognitiveCare. Collective Medical hires Steven Goldschmidt (MatrixCare) as VP of business development, post-acute care. Mark Dunnagan (NC HealthConnex) joins Smartlink Health Solutions as VP of health informatics. Tabula Rasa HealthCare names Kevin Boesen, PharmD (formerly CEO of $131 million Tabula Rasa acquisition SinfoníaRx) as chief sales officer. Boesen, who studied improv at Second City in Chicago, launched a popular skit-based video series with his brother about the pharmacy profession while both were professors at the University of Arizona. Cancer informatics company Inspirata hires Greg Tennant (DrFirst) as chief strategy and marketing officer. Inspirata acquired Caradigm from GE Healthcare in June. ClearData appoints Michael Donohue (Axial Exchange) chief marketing officer and Dean Fredenburgh (AWS) chief revenue officer. Greenway Health hires Susan Kohler (Centene) as chief compliance officer and Patrice Nedelec (SCC Soft Computer) as VP of quality assurance and regulatory affairs. Orlando Health will implement Epic, joining several of the largest Allscripts Sunrise customers that have done the same. Ten-state Adventist Health System selects Vyne Medical’s Trace communications management software. In Michigan, the Genesys Physicians Hospital Organization will implement Allscripts subsidiary 2bPrecise’s Genomic EHR Monitor. Ohio’s Hospice will deploy Netsmart’s EHR at its eight facilities. 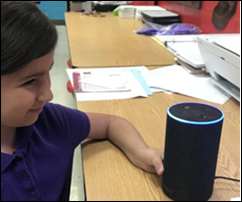 Kids Rock Cancer-Maryville University goes live on FormFast as part of its music therapy programs for pediatric cancer centers. Geisinger (PA) adds ProviderMatch for Consumers from Kyruus to its website, giving patients the ability to find best-fit physicians and schedule appointments. Carefluence announces GA of its FHIR-enabled server and tools on AWS. Walgreens pharmacies and Verily will work together to develop solutions for patients with chronic conditions, initially focusing on medication management and a virtual solution for type 2 diabetes patients. Employees are encouraged to keep the company’s wealth local by living within 45 minutes of campus and buying from area merchants instead of Amazon. All employees have private offices, every conference room is required to have windows, and stairs are mandatory for socialization even though the climbing requirement limits building height to three stories. The 75-year-old Faulkner, who the reporter describes as shy and distracted, told her that she will never retire. The majority shareholders – mostly Faulkner’s future heirs and Epic employees – have been instructed to always vote to keep Epic private, and when they have to choose a new CEO, to pick an Epic software developer. Each employee gets a company-paid, month-long sabbatical every five years, with Epic footing the bill for two people. Doctors who audited the system found that the chatbot gave the wrong diagnosis 10-15 percent of time. 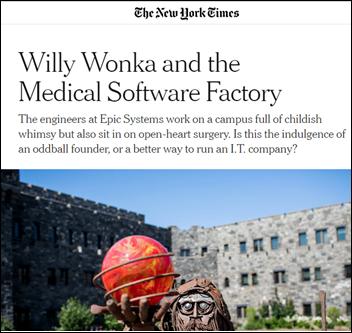 The company ran afoul of advertising regulators who found that the “independent study” that validated its triage feature was actually internal testing involving professional actors posting as patients by following company-provided scripts. Babylona claimed that its chatbot scored higher on medical exams than human doctors, but didn’t mention that the software was required to answer only 15 of 50 questions and was allowed to submit three answers to each question. The company claims to be unaware of analyses suggesting that its users seek ED care at a higher rate than those who call England’s 111 advice line. 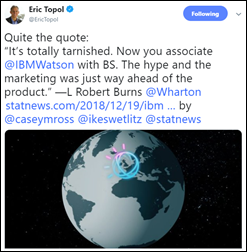 Babylon’s focus on “building fast” and “reaching escape velocity” caused it to downplay the concerns of its employee doctors while treating its data scientists like rock stars. The company will need to apply its technology to more patient records and to measure its outcomes to be successful. Chipotle started requiring employees to sign arbitration agreements as a condition of employment in 2014, a practice affirmed as legal by a Supreme Court case involving Epic. Now Chipotle is being overwhelmed by the number of pay-related arbitration cases that have been brought against it by former employees – each involving a cost of $30,000 to $50,000 – and has tried to convince a judge to stop accepting the filings. He said no. Chipotle hasn’t been paying its share of the arbitration filing fee and is fretting that each case must be heard in the individual county in which the employee worked (and Chipotle has 2,400 locations all over the country). EPSi releases v18.3 with several functional and performance improvements. PatientKeeper reports that it has deployed its EHR optimization software at 24 sites over the last year, representing 1,900 end users. Loyale Healthcare extends wishes for peace on Earth, goodwill to patients, and prosperity for providers in 2019. Imprivata develops EPCS Ready, an online resource for providers preparing to meet federal Electronic Prescribing for Controlled Substances requirements. PMD expands access to its free, HIPAA-compliant, text messaging service for care teams. Intelligent Medical Objects congratulates winners of the AMIA PitchIT! competition. PM360 magazine selects ConnectiveRx’s BrandHub portal as one of the most innovative services of 2018. A study in the World Journal of Diabetes validates the TriNetX platform’s ability to use real-world data to generate real-world evidence to replicate results from randomized clinical trials. Big Data continues to be a buzzword and I enjoy hearing about novel applications. The Journal of the American Medical Informatics Association recently published an article covering a system that uses online Yelp restaurant reviews to identify foodborne illness. The system is currently in use by the New York City Department of Health and Mental Hygiene to monitor for foodborne illness complaints. It classifies review based on whether they indicate illness, and if so, whether multiple people are involved. It has identified 10 outbreaks and over 8,500 complaints. Missouri is the only state in the US that doesn’t have a Prescription Drug Monitoring Program, and Governor Mike Parson has indicated he’d like to sign legislation that is “long overdue.” Parson, a cattle farmer by background, came into office following the resignation of the former governor following a scandal. He’s keenly aware that the state is the only one without it, although friends practicing in the state tell me that St. Louis County launched its own database that aggregates data for a large portion of the state. Maybe they can harness the existing system rather than re-create the wheel. My state’s PDMP has helped me in the clinic more times than I can count, so I feel for those who don’t have access to the tool. Missouri also recently approved marijuana for medical use. When I called my former classmate to ask her about the PDMP situation, she noted that her office received 20 phone calls about it the day after the election. Good luck to those of you in the Show-Me State. Speaking of controlled substances, a US Food and Drug Administration panel recommended this week that physicians who prescribe opioid drugs should also prescribe the overdose reversal drug naloxone. This would lend itself nicely to order set and clinical decision support functionality, although there’s quite a bit of debate as to its necessity and the amount it would add to overall healthcare spending. There’s also debate about patients getting naloxone added to their pharmacy profiles since that data can be used for other purposes, such as life insurance underwriting. NPR recently reported on a nurse who was denied coverage because she carries the drug as a healthcare provider who is willing and able to use it should she come across a patient experiencing an overdose. The issue highlights the dilemmas faced by many of us in healthcare, where even the best-intentioned ideas can have numerous downstream consequences. 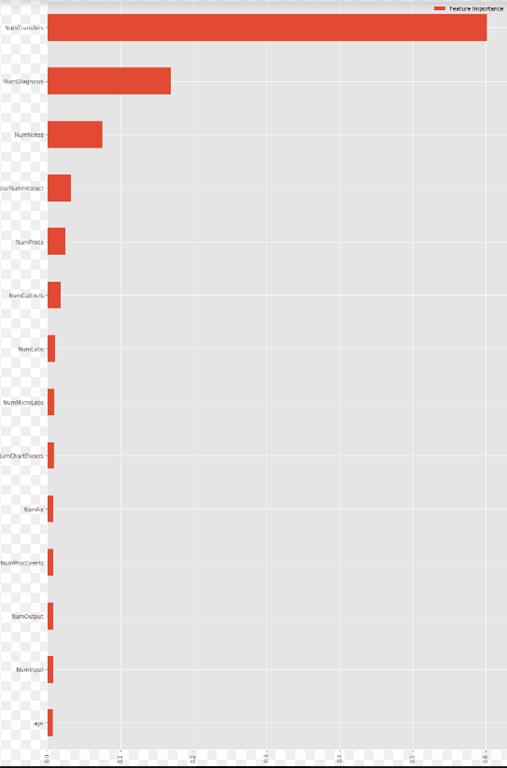 Users, beware: SplashData has published its annual list of the 100 worst passwords of the year, based on five million leaked passwords found on the internet. The worst offenders continue to include “123456” and “password.” Other new entries on the list include “donald” (which debuted at number 23 and may be inspired by our Commander in Chief), “sunshine,” “princess,” “charlie,” and “! @#$%^&*.” The old standbys of “admin,” “welcome,” and “iloveyou” remained on the list, although I’ve never been enamored of my computer or my job enough to consider the latter option. Dr. Jayne’s inbox has been flooded with announcements from various companies who plan to participate in the JP Morgan Healthcare Conference in San Francisco. There are usually some interesting keynotes at the conference, whose attendees are clients of JP Morgan. It looks like there are several hundred presenters from startups to the usual big players. Another round of press releases will follow the actual conference, including transcripts and sometimes recordings of the presentations, so I have that to look forward to. I’d be interested to hear from anyone who has attended including what they thought of it and if they learned anything that they couldn’t glean otherwise. A shout-out to Jenn over at HIStalk Practice and her coverage of medical-themed holiday decorations at her local hospital. If you’re not including HIStalk Practice in your regular news roundup, you’re missing out. 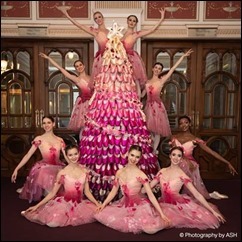 Workplace-themed trees aren’t unique to healthcare, such as this one made of used pointe shoes at the English National Ballet. I’m going to stick with my sub-$40 lab coats and the durable scrubs that I know I can just about boil. I’ve been wearing scrubs for the better part of two decades and have had hospital-issued ones, personally-purchased ones, high-performance designs, extra-cheap designs, and one double-breasted scrub top I had to wear during a transplant team trip that made me think I was in a sci fi movie. I guess I’ve been lucky that I never felt that they had a “negative psychological impact” while I went about doing my job. The only problem I’ve ever witnessed with ill-fitting scrubs was during an emergency C-section, when the pregnant obstetrician had her overly large scrubs pulled up above her belly. When she ran down the hall, they slid down, almost making her trip. Since they were hospital-issued, OR-mandated scrubs, it’s not like she could have strolled in wearing fashion maternity scrubs. What do you think about lifestyle brands in the healthcare space or the concept of lifestyle brands in general? Leave a comment or email me. 3M will acquire MModal’s AI-powered physician documentation technology for $1 billion. GE firms up plans to spin off its healthcare business via a public filing that will likely take place in mid-2019. Walgreens and Verily will work together to develop solutions for patients with chronic conditions, initially focusing on diabetes and medication management. Using the daily averages of interactions allows the ML model to predict the LOS on a daily basis, as these averages are being modified on a daily basis. I’ve removed mortality from this dataset as I don’t want to provide hints to the model in the form of mortality = short LOS. Besides, when asked to predict LOS, the model should not be aware of the overall admission outcome in terms of mortality as it may be considered data leaked from the future. The hospital LOS in days is the label of the dataset, the outcome we’d like the ML model to predict in this supervised learning exercise. Please keep in mind that a short LOS is not necessarily a good outcome. The patient may have died and thus a short LOS. In addition, there may be circumstances where a shorter LOS is accompanied by a higher readmission rate. In order to get the full picture, one needs to know the mortality and readmission rates associated with a specific LOS. 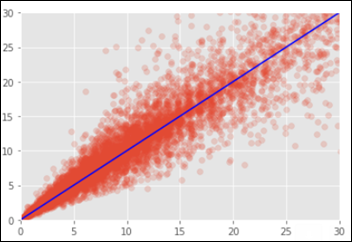 The Python code used for predicting LOS with regression ML models, is publicly available at Kaggle. Data was separated into a train (47,180 admissions) and test (11,796 admissions) datasets as previously explained. 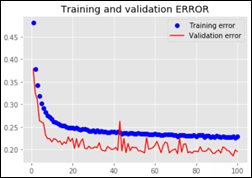 I’ve trained and cross-evaluated 12 regressor models: Gradient Boosting Regressor, Extra Trees Regressor, Random Forest Regressor, Bayesian Ridge, Ridge, Kernel Ridge, Linear SVR, SVR, Elastic Net, Lasso, SGD Regressor, Linear Regression. The best model, Random Forest Regressor (RFR), came on top with a Mean Absolute Error (MAE) of 1.45 days (normalized MAE of 11.8 percent). This performance was measured on the test subset, data the model has never seen during training. 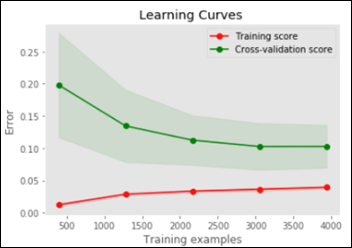 The learning curves show that the model is overfitting, as the validation MAE is stuck on approximately 0.12 or 12 percent, while the error on the training set is much lower at 5 percent.Thus, the model would benefit from more samples, better feature engineering, or both. Below is the chart of the predicted vs. the true LOS on the test dataset. On the X axis are the number of real days in the hospital and the Y axis is the predicted LOS by the RFR model. In a perfect situation all points would fall on the blue identity line where X=Y. The best NN MAE is 2.39 days or a normalized MAE of 19.5 percent. The NN performance is worse when compared to the RFR model. The Python code used for this part of the article, is publicly available at Kaggle. 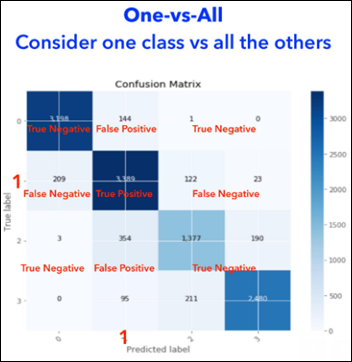 The above confusion matrix shows the predicted vs. true labels for all the 4 LOS groups. 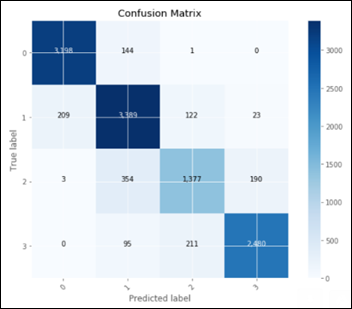 We cannot use such a confusion matrix for calculating precision, recall, F1 and AUC as these metrics require a simpler, 2 X 2 confusion matrix with TP, FP, TN and FN. We need to calculate for each one of the four LOS groups – its own confusion matrix and derived metrics. The higher the F1 score and AUC, the better is the model performance. 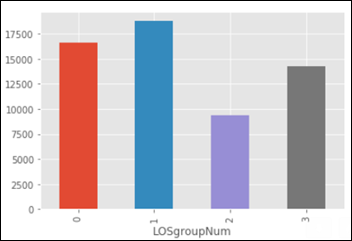 Both the RFC and the NN models are performing best when evaluated on the first group-vs.-all: LOS below vs. above 4 days (LOS group 0). Random Forest is an ensemble of other weak predictor models. Still it outperforms any NN by a large margin with both the regression and classification challenges of predicting the LOS. It is interesting and maybe worth an article by itself, how a group of under performing “students” manage to use their error diversity in achieving a better outcome than the best-in-class NN models. Canada-based health IT vendor Premier Health will acquire Cloud Practice, which offers an EHR based on an open source product developed by McMaster University, for up to $5 million. Teladoc Health EVP/COO/CFO Mark Hirschhorn resigns following publicity and lawsuits over his romantic affair with a since-resigned Teladoc employee to whom he gave stock tips. ResMed’s post-acute care technology subsidiary acquires Apacheta, which offers mobile software for medical equipment vendors. Chronic disease management technology vendor Livongo Health hires Zane Burke (Cerner) as CEO, replacing Glen Tullman, who moves to executive chairman. HHS OCR issues an RFI for help in identifying aspects of HIPAA’s privacy and security regulations that may be impeding value-based care and care coordination. Eliminating the requirement that providers get written acknowledgment that patients have received a Notice of Privacy Practices. OCR is also looking at how long it takes for patients to get copies of their medical information, whether the currently allowed 60 days is too long, and whether covered entities should be required to give patients copies of their electronically stored information faster. 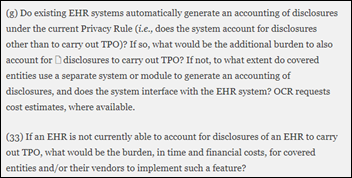 Also in the RFI is an important clue about OCR thought process – they want to know if providers are refusing to share PHI for treatment purposes or are requiring requesting providers to fill out request forms that go beyond HIPAA. The long document is mandatory reading for those who follow HIPAA requirements and information sharing. From Med4295831: “Re: Greenway Health. Sent an email this week to all customers recommending that they file a MIPS hardship exemption for 2018 because Prime Suite’s Promoting Interoperability measures were calculated incorrectly.” Unverified, but the reader sent the email he or she says they received. The companies were looking for exposure in hoping for that particular outcome. Companies moving up the food chain may sponsor at a higher rate and thus would attract attention otherwise simply because they are growing and honing their message. The exposure drew attention to them that they wouldn’t have had otherwise, perhaps of the Fear of Missing Out variety. Coincidence, especially since I have quite a few sponsors. 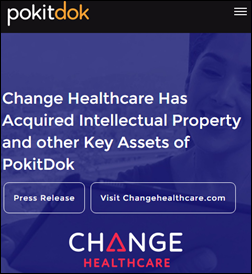 Change Healthcare acquires “intellectual property and other key assets” of health IT API and blockchain vendor PokitDok, which Change will use to launch its API and Services Marketplace. Canada-based health IT vendor Premier Health will acquire Cloud Practice, which offers an EHR based on an open source product developed by McMaster University, for up to $5 million, most of it in tiny-capitalization shares whose price has swung wildly between $0.04 and $0.85 in the past year. ResMed’s string of health IT acquisitions continues as its Brightree post-acute care technology subsidiary acquires Apacheta, which offers mobile software for medical equipment vendors. 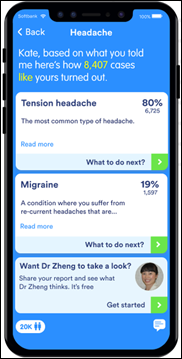 K Health, which offers a free AI-powered, questionnaire-driven app for consumers that uses a “People Like Me” history database, raises $25 million in a Series B funding round, increasing its total to $38 million. The company’s business plan apparently involves eventually selling its service to employers and placing referrals to paying doctors. The Israel-based company, formerly known as Kang Health, obtained its treatment history database from an HMO in Israel, which is likely a limitation for the US market. Johns Hopkins Medicine will implement Nuance Dragon Medical One and Dragon Medical Advisor for its “Joy at Johns Hopkins Medicine” physician burnout reduction program. Mid-Valley Hospital (WA) chooses Cerner Millennium and HealtheIntent. FDA names Amy Abernethy, MD, PhD (Flatiron Health) as principal deputy commissioner for food and drugs. Providence St. Joseph Health hires B. J. Moore (Microsoft) as CIO. Moore — whose background includes cloud, AI, and enterprise commerce – will report to the health system’s CFO, who also came from Microsoft. It’s an interesting choice for the country’s third-largest health system given that Moore has no advanced degree, no healthcare experience, and a deeply technical work history. It’s also odd that he’s reporting to the CFO, who also had no previous healthcare experience. I don’t know how EVP/CIO Janice Newell fits in – she’s still on the leadership page, but wasn’t mentioned in the announcement. Todd Rothenhaus, MD (Athenahealth) joins medical equipment tracking system vendor Cohealo as CEO. He replaces co-founder Brett Reed, who will move to president. Chronic disease management technology vendor Livongo Health hires Zane Burke (Cerner) as CEO, replacing Glen Tullman, who moves to executive chairman. The company also promoted Chief Medical Officer Jennifer Schneider, MD, MS to president. Livongo’s valuation is $800 million and Tullman has indicated that the company may go public in early 2019. Paula LeClair (Onduo) joins Glytec as executive director and GM of outpatient. Atrium Health hires Rasu Shrestha, MD, MBA as EVP/chief strategy officer. NextGen Healthcare launches Health Data Hub, a cloud-based HIE platform for sharing and aggregation of patient data. Netsmart will work with Kindred Healthcare to develop a clinical platform for long-term, acute care hospitals, rehab, and care management. Senator Lamar Alexander (R-TN), who is active in federal health IT initiatives in his roles of chairman of the Senate’s HELP committee and author of the 21st Century Cures Act, will not seek reelection in 2020 after serving three terms. Teladoc Health EVP/COO/CFO Mark Hirschhorn resigns following publicity and lawsuits over his romantic affair with a since-resigned Teladoc employee to whom he gave stock tips. The company had previously stood by its decision to discipline Hirschhorn with a one-year suspension of share vesting. TDOC shares dropped 6 percent after Monday’s announcement but regained ground Tuesday, having increased 35 percent in the past year vs. the Nasdaq’s 2.4 percent loss. “History of” is not a good choice of words since it suggests that the condition has resolved. Doctors who argue that “I’ve always done it this way” also don’t see the benefits of turning their patients over to hospice doctors like the author. “Billing” is not the same as “compliance” and being counseled for the former posing as the latter is not ethical. The VA doesn’t have those problems – they use the language that’s best for communication among healthcare professionals. Just wait until hospitals try to make you document every inpatient as having malnutrition to make the numbers look better. Being paid by CMS requires jumping through hoops and the compliance officer is just trying to do their job in an insurance-driven world. Open a direct patient care practice and stop taking insurance. A judge rules that the former CEO of St. Mary’s Hospital (FL) can sue CNN for libel over a report by Anderson Cooper in which the hospital’s pediatric surgery mortality rate was claimed to be running triple the national average. David Carbone, MHA says CNN compared the hospital’s 12.5 percent mortality rate for open heart surgery to a national average for all surgeries and didn’t risk-adjust the data. The hospital closed its pediatric cardiothoracic surgery program two months later amid public backlash, triggering CEO Cardone’s resignation. CNN argued that its report didn’t mention Carbone by name and that disagreeing with the method of comparing mortality rates doesn’t support a claim of intentional defamation. A woman had a heart attack after not taking her prescribed statin because she had read wacky Internet information from sites run by zealots, peddlers of alternative therapies, and people just looking for attention. False claims that HPV vaccine causes seizures has reduced vaccination coverage in Japan from 70 percent to less than 1 percent. 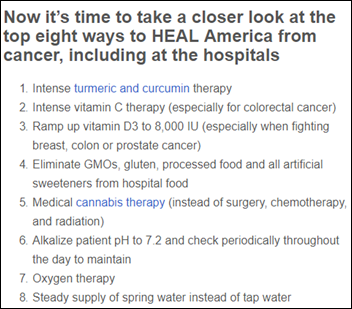 Sites pushing alternative therapies for cancer argue that tumors are a healthy reaction, that surgery spreads harmful cells, and that medications cause cell mutations by increasing acidity. News sites regularly overstate alternative therapy benefits because less-rigorous observational studies that contradict medical wisdom make better stories than the not-shocking results of randomized controlled trials. Weird News Andy titles this story “Socks Appeal.” A man who sniffs his socks every evening after work when changing clothes develops a severe respiratory fungal infection from breathing in spores. Casenet staff volunteer at the Christmas in the City event in Boston. Audacious Inquiry appoints Penny Thompson (CMS) to its board. Flatiron Health CMO Amy Abernethy, MD joins the FDA as principal deputy commissioner. CNBC reports that Change Healthcare will acquire health data integration vendor PokitDok as early as this week. B.J. Moore, a Microsoft VP with experience in cloud and AI, joins multi-state Providence St. Joseph Health as CIO. I recently had an invitation to attend a webinar on artificial intelligence in medical imaging. There was a recent article on the same topic that’s still sitting in my “to skim” pile, so I thought it might be good to go ahead and take a peek. I have to read diagnostic images as part of my day job. It’s one of the more challenging parts of my practice, primarily because I didn’t do it for a decade and was out of practice. Most of the images we encounter are x-rays we’ve ordered on our own patients, which seem easier to read because we have the whole clinical picture and know what we’re looking for on the images. 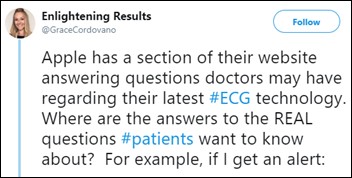 For quality purposes, we also over-read the studies ordered by other physicians at different locations, which can be challenging because you don’t always have the whole clinical picture. The most challenging images however are the CT scans. We’re not doing the primary readings on those, but due to some quality issues with our virtual radiologists, we’ve been asked to review all of our images. Given that my formal radiology training was a two-week rotation more than two decades ago, I’ve been seeking out educational resources to help improve my skills. Still, each time I come across an image that has questionable findings — whether it’s a CT or a regular x-ray image — I can’t help but think that having some computerized support would be beneficial. Most of the articles I’ve seen on the topic are specifically directed at the incorporation of AI into radiology workflows. I haven’t found very much research looking specifically at AI within primary care radiology workflows. In getting AI technology approved, studies look at whether the technology can identify the correct findings at least as well as the radiologists, who are usually residency trained and board certified. I’m sure there’s a preponderance of academic medical center radiologists reflected in the studies, and I would suspect that outcomes might be different in those institutions where radiology is highly specialized compared to community hospitals, where radiologists may be more generalists. There may be even different outcomes in accuracy of readings when you throw emergency physicians, internists, pediatricians, and family physicians into the mix as they read films in their offices and various outpatient settings. Several of the potential solutions being evaluated in radiology involve support prioritizing the radiologist’s work list. Some algorithms analyze screening tests where the majority of studies are negative and highlight those images where an abnormality may be present. This is being done for studies like mammograms, where imaging technology is moving from 2D to 3D images, creating additional image volume and requiring additional time to read each study. The goal is to prioritize those that are the most high-risk so that they are addressed quickly and carefully. Other solutions are looking at areas where an abnormal study poses a high risk, such as post-trauma head CT scans. Even though they’re not studying readings by primary care providers, there’s some exciting work being done with chest x-rays. One effort looked at 1.2 million images working to create an algorithm that would assist in “low-resource settings” without radiologists, which would certainly apply to my practice. Once the system was trained to identify specific findings — such as heart enlargement, calcification, presence of fluid, and opacity — it was tested against a panel of radiologists looking at a set of 2,000 x-rays. The system reliably identified the findings roughly 90 percent of the time. I wonder how it would score against non-radiologists looking at the same images. There are particular types of x-rays that I still struggle with, because they can be difficult to read just because of the body part you’re looking at. Rib x-rays are an example and are challenging because the ribs sit on top of dense parts of the body (the heart, the spine, and major blood vessels) and because they curve and angle, which causes overlap when you’re trying to figure out what you’re looking at. They’re also tricky when you’re dealing with larger patients, who have more tissue for the radiation to penetrate. I had a patient with some trauma who came in sounding like he had a broken rib. Normally, I’d prefer to order a CT scan because it gives you much better pictures of ribs without overlap. However, I was working at one of our outlying locations that doesn’t have CT, so I went with the plain film. There were indeed some rib fractures. I identified what I thought were two separate issues, but my partner doing the over-read didn’t agree — she thought there was only one. Regardless, the one looked strange enough that I felt a CT was indicated to fully define what was going on and transferred him for the study. Within 20 minutes we had a radiologist on the phone telling us he had three fractures and also a collapsed lung, which neither of the initial reading physicians picked up on the x-ray. In hindsight you can see it, but it’s a really subtle finding and the border of the lung overlaps with the edge of a rib, right at the top of the chest where there’s a lot going on in the film. It’s likely that both of us were focused on the indication of “rule out rib fracture” and even though we did assess for lung issues, we didn’t see it. That’s the problem with human brains and how we process information. We’re constantly prioritizing what we’re working on and rapid switching is a factor when we’re addressing multiple tasks (I had eight assigned patients I was covering at the time I was looking at the films). As a physician, you feel terrible when something like this happens, but it does happen. I’m grateful that the only issue here was a brief delay in diagnosis. The patient’s condition had not deteriorated in the time it took to get the CT can and he had normal vital signs and oxygenation the entire time we were evaluating him. The biggest challenge I had was finding a hospital to accept his transfer, since his preferred hospital suggested that I send him elsewhere because “our folks don’t like to take care of that.” Not exactly a ringing endorsement, but the closest Level 1 Trauma Center was more than happy to accept him. I look forward to the day when I have some AI helping me out in the trenches. Hopefully we’ll get to that point before it’s time for me to retire. What do you think of AI in diagnostic imaging? Leave a comment or email me. Kevin MacDonald is co-founder and CEO of Kit Check of Washington, DC. I’ve been doing RFID and helping various parts of all kinds of different supply chains for 20 years. I started with Sun Microsystems, did a consulting company, and then I started Kit Check in 2011. A friend of my wife was a pharmacist. She was on crash cart duty and having an awful time. I said, boy, there’s an awfully difficult and hard to manage supply chain for drugs inside the hospital, not to mention outside. I think we can make the pharmacist’s life better and more efficient while making the drug spend cheaper and the end result safer. How are hospitals using Internet of Things and RFID? You typically hear about RFID in hospitals for tracking things that you don’t want to throw away, like capital equipment and people. Real-time location systems are kind of expensive. We focus on things that you actually do throw away, consumables such as, in this case, drugs. There’s a great ROI there. We are approaching 500 hospitals now and growing very quickly. We are thrilled that we’re now tracking more than one new medication every second, but there’s still a lot of room to grow. The potential benefit in labor savings and medication tray dispensing accuracy is obvious, but how would a hospital pharmacy use your system to manage a drug recall or manufacturer shortage? Imagine you have 150 carts across the hospital. Something is recalled. You’re going to send a tiger team of pharmacists around, taking hours or probably days for many people to open up and check each individual cart. Our system knows every single vial and every single place. We know exactly where to go to address recalls, where you do and don’t need to go. That multi-day process goes down to a matter of minutes, unless of course the recalled drug is absolutely everywhere, in which case you need to go to all the carts anyway. As we’ve expanded to so many hospitals, we have a system where if two hospitals enter a recall, we scan everyone else’s inventory. We say, hey, you have a drug that was identified as recalled by other hospitals. We’re often ahead of both FDA and RASMAS in recalls. Do you see other potential for network-effect type usage beyond a single hospital? There are things around benchmarking. Everyone is constantly trying to figure out, what do I put in a crash cart? What do I put on the anesthesia floor? It’s typically a discussion or a debate rather than a fact-based situation. We can bring data about both what’s in your hospital as well as what others are doing. That makes it a clearer debate. With controlled substances, the more data we have in the system across hospitals, the more we can learn additional patterns of how people divert medications. We can then make everyone smarter along the way. It’s incredible how many ways people find to divert controlled medications. Having more and more hospitals on the system allows them to get smarter and smarter every day. How does your Bluesight for Controlled Substances improve on software provided by drug dispensing cabinet vendors? The biggest difference is that it takes in multiple data sources and then layers on workflow to do 100 percent closed-loop auditing so that it is comprehensive. It also brings in data from the EHR and other systems and then layers machine learning and AI on top. Dispensing cabinet reports can tell you that a nurse dispenses twice as much fentanyl as another nurse, but there might be a good reason for that. Perhaps they’re doing a cardiac surgery case in the OR. We can look at all patterns, including locations, waste buddies, and time between events, whether it’s dispense-and-admin or dispense-and-return. We understand the situations that are riskier. At the core, we’re doing three things – identifying potential risks, adding workflow to make it actionable, and making it comprehensive by enhancing dispensing cabinet information with data from EHRs and other sources, such as time and attendance systems. At least two nurses have confessed to killing dozens of inpatients using ADC-dispensed drugs, yet weren’t caught for years even though the correlation to specific drug withdrawals or the number of codes called on their work shifts seemed obvious after the fact. 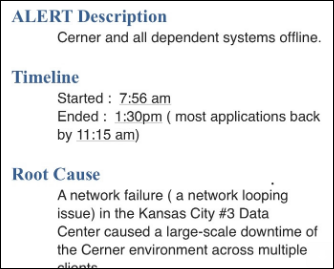 Is that business case for your system even though it’s hopefully a rare event? It’s not easy to prevent, for sure. It is prevalent. Studies have shown that as many as 8 percent — one in 12 nurses, anesthesia providers, and pharmacists — will end up diverting controlled substances. If you take a trip to the hospital and touch a lot of different folks, you have a pretty high probability that some of them are diverting. That goes along a spectrum. Typically, someone starts out slowly. They were playing soccer or something on the weekend and got injured, then decided to do a little pain relief. It slowly builds and gets out of control. Any given hospital at any given time almost certainly has diverters. If they aren’t finding them — which, by the way, most aren’t — there’s risk to patients. Software vendors are claiming that their old products are suddenly using machine learning and AI when they’re actually just running queries. Is your system actually independently learning from the data it sees? 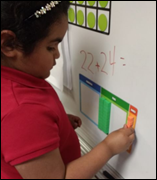 Over time, it’s learning individual patterns and behaviors as well as group patterns and behaviors. At the macro level, we look at several trends across all hospitals. We add in, for example, a waste buddy report, pain score report, or something like that across hospitals. A 100-bed community hospital is very different from an 800-bed academic center. Even between academic medical centers, the practice habits are going to be different. We learn the practice habits at that facility and for groups of people. If you are a NICU nurse, your patterns will be different from an anesthesiologist or investigational radiologist. 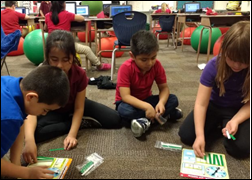 We learn over time what is a normal pattern and what is an abnormal pattern, We’re also looking at individuals to see if their behavior is changing over time and learning what is normal for them. Unlike some other things where it’s just, “Let’s take a bunch of data and run some reports,” there actually machine learning and AI happening here. That would require the system to also know when someone was positively identified as a diverter so it would know it predicted correctly. Is that information provided to the system? We call it an investigative workflow. We identify the folks who are more risky. We’ll never say that someone is absolutely diverting, because there may be something strange that happened that caused them to spike on whatever the set of tools are. Once the hospital starts an investigation, we give them the capability to drill in transaction by transaction. They can start conversations with management. They can then go further in the investigation workflow and escalate up to the time where someone is engaged with HR, rehab, or potentially criminal proceedings. But hospitals usually try to help their providers recover instead of instituting criminal proceedings. We end up learning when all of these things happen. 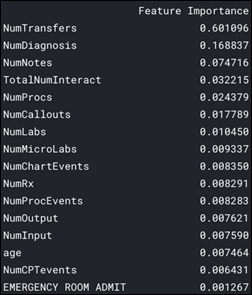 We also see patterns that we’ve seen elsewhere that we might highlight more, or other things that we want to take a look at and then apply to the rest of the hospitals in the dataset. Your company has gotten pretty big, but it sits between EHR vendors and tray and drug dispensing technology vendors, both of which provide information your product needs even though they may have similar offerings. Are you concerned that being successful might cause those big companies to take action in developing a competing product or cutting off access to their information? Our advantage is that we are big enough to have a good-sized engineering team, but we’re small enough to be nimble. We release new code and new functions every two weeks. Those large vendors are often on an annual cycle. It just takes forever. You need constantly update the patterns and the data feeds you’re looking at. We think we’re well positioned, and in terms of the data we need, it’s fairly standard. We can do an HL7 interface, but most folks end up pulling standard reports out of both their EHR and their dispensing cabinets that they end up using for other purposes. I guess those companies could try to do something anti-competitive, but for the most part, we’re just using what’s already out there. One of the most anti-competitive actions they could take would be simply to whip out their large checkbook and buy you out. We’ve got a lot of room to develop. Our core is helping hospitals do those three things that we talked about — saving money on drug spend, being safer and more compliant, and being more efficient. Those all come down to having visibility at the item level. We started in the procedural spaces, where the hospitals were blind. Even if they had a dispensing cabinet, typically the dispensing cabinet counts were way off. We got almost perfect visibility in a place where they were blind. We now have added the nursing floors and the other areas by our learning controlled substances. Over time, we’re going add more and more tools that help the hospital automate things, and again, do those three things. We are venture backed and we’re going to grow and become a bigger company, but we’ve got a lot of growing to do in the mean time. How has the company changed in moving from a business that you personally bootstrapped, sweating those first sales because hospitals take forever to make decisions, to become a significant, venture-funded player? It ha created a lot of opportunity. My co-founder and I were cold-calling. Neither of us had worked with hospitals. Honestly, knowing now how bad the hospital sales cycle is, I’m not sure that we would have started the business. Having scale really helps. With the venture rounds, our investors have been super supportive. They believe in what we’re doing. We’ve been able to build a decent-sized engineering team. Compared to the dispensing cabinet vendors of the world, I think the amount of engineering that we’re putting on software is bigger than some of the publicly traded guys. We can hire amazing people because we’re doing important work. It’s easy for people to get behind that important work as we grow. That’s the most interesting thing about scale. We were at the American Society of Health-System Pharmacists Midyear conference recently. It was really cool to see all the customers out there. We’re not, as one director of pharmacy called us years ago, two nerds in a metal box any more. We’ve got scale and products and we’re solving important issues for the pharmacy. We’ve proven that. We do a good job at it. We’re super excited to be helping our hospital partners, and going forward, not even just hospital partners. We’re working on getting drugs already tagged to the hospital and being able to have full traceability in the supply chain to allow those hospitals, again, to be safer, be more efficient, and lower their drug spend. A federal judge in Texas rules that the Affordable Care Act is unconstitutional because Congress eliminated the penalty for people who don’t sign up for health insurance. Health IT company WellSky acquires hospice and palliative care software vendor Consolo Services Group. Centra Health (VA) attributes a drop in operating margin – its first in more than a decade – to increased costs incurred by its Cerner implementation. A federal judge in Texas rules that the Affordable Care Act is unconstitutional because Congress eliminated the penalty for people who don’t sign up for health insurance. He sided with the White House-supported lawsuit brought by 20 Republican state attorneys general, which argued that if the penalty is unconstitutional, then so is the entire ACA. The Trump administration filed a brief asking the court to overturn the ACA’s ban on preexisting conditions, opening the door for insurers to once again price coverage based on medical history. The White House also opted not to defend the ACA in court, an unusual move for the executive branch that traditionally defends existing laws. The ruling did not include an injunction, however, so nothing will change until higher courts review the ruling. The ACA has survived several more credible legal threats. Texas’s Republican attorney general often files strategic lawsuits in the district of the conservative federal judge, Reed O’Connor, who nearly always sides with Republican challenges to Democratic policies. From Smitten: “Re: fax machines. It’s about time hospitals were dragged kicking and screaming into the 21st century.” I shall allow Calvin and Hobbes to respond. 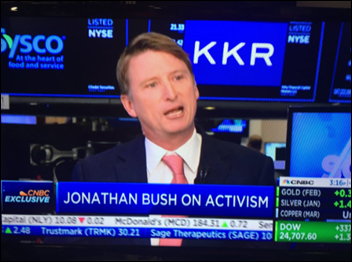 From Sure Winner: “Re: Jonathan Bush’s comments. It makes you contemplate whether today’s ‘what have you done for me lately’ investment environment is capable of driving long-term economic growth versus short-term profits and churn. Investors don’t care about mission and long-term vision. We see the same problem in the VC startup funding space. I question whether there is even a place for publicly traded companies in a field like healthcare that should be steered by a higher moral compass.” The problem with taking investment money (including going public) is that your #1 customer is now fickle shareholders, and whatever business you thought you were in becomes secondary to making good-looking numbers each and every quarter. You can maintain some degree of control if you resist taking too much money early and thus can set a long-term trajectory that is clearly good for everyone, but as in Athenahealth’s case, you can ignore individual investors only to the point they own enough shares to bully the board (and Athena’s board showed zero backbone in jettisoning Bush on non-news and character assassination planted by the activist investor turned eventual participant in the acquisition). As for healthcare, the moral compass is now permanently subservient to the quest for the dollar even in non-profits, although the private equity purchase of nursing homes, medical practices, and hospitals is a particularly troublesome development that could happen only in a screwed-up healthcare country like ours. It’s a slippery slope once you declare healthcare to be a business as happened in the 1960s with the rollout of Medicare, when hospital patients become a MBA-managed production widget and healthcare became known for massive costs, poor outcomes, impressive buildings, and economy-leading employment. The venture capitalist will see you now. 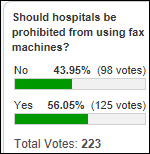 Just over half of poll respondents think that the US should follow England’s lead in banning fax machines in hospitals. GZ says a ban isn’t necessary and faxing is a good backup to more modern options. Brian Ahier thinks CMS should lead the movement and stop requiring clinicians to fax information to it, while Edward Hobbs agrees that Medicare and Medicaid are among the worst offenders in requiring either mailed paper copies or fax. Frank Poggio notes that it’s not just healthcare – other industries require the barely-better option of printing, signing, scanning, and emailing PDFs instead of using electronic signature. Dr. Rick blames fax usage on poor EHR design. RobLS says OCR should crack down on insecure PHI transmission. Crying Fowl believes doctors should be required to use secure electronic communication as a condition of licensure and notes that referral information often comes from non-providers such as schools that don’t have fax alternatives, although he or she advocates outlawing faxes from pharmacies in states that have mandatory e-prescribing. New poll to your right or here: Which ways have you used in the past year to communicate with your PCP? I came up with quite a few choices, but I’m sure I still missed some (though I omitted telephone calls intentionally). I saw a hospital’s entry into my RFI Blaster for requesting consulting engagement information from several HIStalk sponsors, which reminds me to remind you that it exists. Fill out the simple form and send your RFI to one or several companies in a couple of minutes. 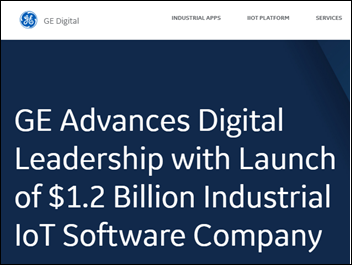 GE is frantically trying to undo the Jeff Immelt-caused damage that just about tanked the whole enterprise (and may still do so), with this as the latest redo – the company will try to create a separate business from the dregs of GE Digital, the company’s failed attempt to remake itself into a software vendor focusing on Internet of Things automation of manufacturing. GE Digital CEO William Ruh will leave the company and GE CEO Larry Culp predicts that the spun-off business will perform better in not being managed by GE, which says all you need to know about GE (despite GE’s self-admiration for cranking out great managers, Culp’s an outsider, having made hundreds of millions running a medical device company). GE shares have bled 60 percent of their value in the past year, now priced about the same as they were in 1992. It’s exhausting trying to keep up with what Amazon may or may not do in healthcare. CNBC reports that the company considered moving into home health testing via a potential acquisition of Boston-based Confer Health that never occurred. Confer, whose technology hasn’t yet been approved by the FDA, was founded by a Harvard PhD neuroscientist and the obligatory computer guy (and online ad technology developer) who has recently moved on to become a product manager for my favorite online furniture store Wayfair. Valley Health System (NJ) chooses NextGate’s EMPI. A Waystar survey finds that two-thirds of Americans are challenged in at least one category of social determinants of health and most of them don’t talk to their doctors or insurers about it. 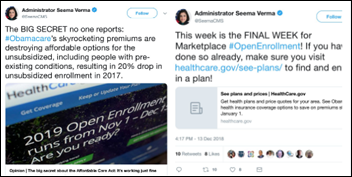 Politico’s Dan Diamond contrasts the suddenly apolitical ACA-related tweets of CMS Administrator Seema Verma (last year vs. this year above) as Open Enrollment wound down this weekend and an HHS transparency investigation by House Democrats looms. The country’s long life expectancy and low-cost doctor visits have caused healthcare costs to increase at 40 times the rate of economic growth since 2000 even as Japan’s taxpayer base shrinks. The country’s universal coverage allows patients to see doctors whenever they want without seeing a gatekeeper first and for doctors to bill for as many patients as they can see. Most doctors work in hospitals, which have a globally disproportionate number of beds and an above-average amount of expensive diagnostic equipment. Those over 65 are responsible for two-thirds of the healthcare costs and will vote against politicians who suggest reining in expenses. Doctors do not coordinate care and the government worries that they won’t participate in a data-sharing network that is planned for 2020. A woman who announced her pregnancy on social media, clicked on Facebook maternity-wear ads, created a baby registry on Amazon, and tagged Instagram photos with #babybump complains that she was served up targeted baby-related ads after her child was stillborn. Instead of questioning why she needed to share her personal information on ad-targeting sites that make it clear that they use it for deliberate intrusion, she says those sites should have used the same technology to infer her loss from her postings and then suppressed the ads. 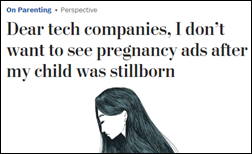 She also blamed Facebook for not providing an option to turn off parenting ads, although it offers exactly that deep in some menu. Weird News Andy says Southwest Airlines must have a heart beyond the one in its logo. A SWA flight bound for Dallas returns to Seattle when the airline realizes that a “life-critical cargo shipment” (a human heart) was inadvertently left on the plane instead of being delivered to a local tissue bank. The re-routing allowed the heart to reach its destination before it would have been unusable. I was curious about the tissue bank, LifeNet Health — it reported 2016 revenue of $353 million and paid its CEO $1.4 million. 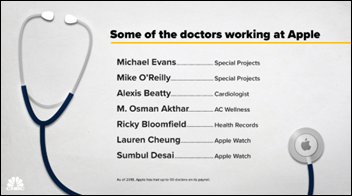 It’s fascinating to see the healthcare niches that are exploited by multi-million dollar businesses. 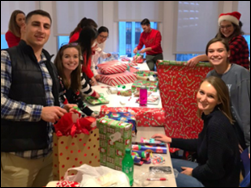 PatientPing employees participate in the Massachusetts Department of Children & Families’ annual holiday drive. 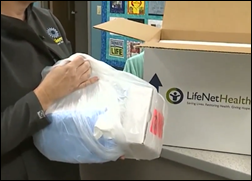 The local news features Mobile Heartbeat’s partnership with Corpus Christi Medical Center (TX). Wolters Kluwer Health and the Association of Community Health Nursing Educators will award a grant to a nurse educator to support community and public health educational research. Nordic CEO Bruce Cerullo is recognized as one of the top 50 large-company CEOs in the US, as rated by employees. 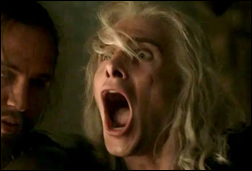 Tongue-in-cheek researchers publish an ICD-10-coded analysis of how the characters on “Game of Thrones” died, accounting for how the 56 percent of 330 characters met their demise (only 1 percent of them from natural causes, since hey, who wants to watch that?) Three-fourths of the deaths involved succumbing to injuries ranging from wounds, burnings, and poisonings. Median character survival was 29 hours, with the most unfortunate character expiring after just 11 seconds. On a more serious note, the authors conclude that the development of nation-states with infrastructure and trade programs have led to the decline of violent deaths from 40 per 100,000 in the middle ages to 3 per 100,000 today. Hundreds of email and phone bomb threats cause hospitals and other business in the US and Canada to evacuate, with bitcoin payment demanded to prevent detonation of hidden explosives. It’s a physical version of ransomware, except in this case, it’s a hoax. The messages appear to have been sent from Russia. A BMJ-published study finds that ED-admitted hospital patients who are discharged during the two weeks around Christmas have a higher incidence of readmission and death, which the authors speculate is due to hospital employees taking days off, the reduced hours of ambulatory physician practices and clinics for follow-up care, and patients delaying treatment until after the holidays. I’ve always found it interesting that the hospitals I’ve worked in discharged a big percentage of patients right before Christmas, some of whom came back right after. You can bet that those who stay over need a lot of care. 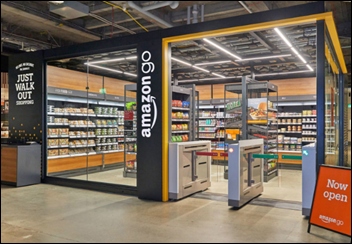 Amazon opens a 450-square-foot version of its cashier-less (“just walk out” smartphone-powered checkout) Amazon Go convenience stores, targeting office buildings, hospitals, and possibly airports for selling salads and snacks. It’s more like a giant vending machine than a tiny store. 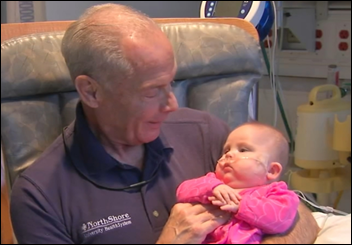 Evanston Hospital (IL) signs up retired grandfather Carl Magnussen as its first male “baby cuddler” volunteer in a program in which infants who will remain hospitalized for weeks or months are held daily by volunteers at the request of parents who can’t visit regularly. The hospital says clinical staff can see the positive results in the vital signs monitors of the babies, while Carl says it’s like meditation in watching the baby snuggle in and go to sleep. 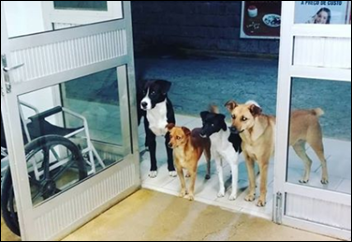 In Brazil, ED nurses notice four dogs waiting patiently as staff are treating a homeless man at 3 a.m. The patient explained that he often gives his own food to the dogs, going hungry so they can eat. Employees brought the dogs inside and provided food so the dogs could share a meal with the patient. OCR seeks input on modifying HIPAA rules to improve coordinated care, with comments due February 11. EHR and RCM vendor Medsphere will use $32 million in new financing for expansion efforts, including acquisitions and hiring. Apple will spend $1 billion on a second campus in Austin, TX, which will house up to 15,000 employees on 133 acres. From Mad Fax Beyond Interoperability’s Thunderdome: “Re: eliminating faxes. Not only is faxing universally available, it is built on an open standard, deployed on an open architecture, and immune from adding tolls or being hijacked for monetization. 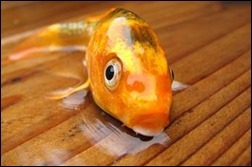 The ‘usefulness’ to anything other than human eyeballs brings security. Other technical solutions could solve this, but the trend toward walled garden tools and away from net neutrality worry me. The vector doesn’t quite reach Mad Max post-apocalypse concepts, but a return to sneaker net is not out of the question. Patient-centered-distributed, edge-of-network that allow individuals to get their own information are out there, such as HIEofOne.” Faxing is like aspirin – it would be a headline-splashing miraculous development making people gazillionaires if it were released today. Faxing is a symptom of our healthcare system’s failing rather than one of its problems. Be careful of wishing ill will upon fax unless your memory is short enough not to remember what healthcare was like without it or your naivete is so strong that you see only good things resulting from taking away something that just works. From We Bring Good Things to Life (By Selling Them to Better Companies): “Re: GE. Rumored to be selling its RCM business to Athenahealth.” Unverified. From HIStalker: “Re: Advocate Aurora Health. Had a drama-free multi-specialty, big bang go live on Epic on December 1, replacing Allscripts. The first of 10 hospitals will go live in October, replacing Cerner. When complete, AAH will be one of Epic’s largest single-instance customers. Cerner Healtheintent will remain in place.” The Chicago-area mega-system has 70,000 employees and annual revenue in the $11 billion range. From LA Lady: “Re: HIMSS. CEO Hal Wolfe unceremoniously dumped long-time, highly visible COO Carla Smith without a public announcement. She deserves at least a thank you for her tireless work.” Carla’s LinkedIn says she left HIMSS in November after 17 years and is now consulting. I don’t know the circumstances of her departure. New leaders have the right to pick their team, but we as dues-paying members might question those choices and how they affect (or signal) the organization’s direction that we don’t get to explicitly vote on. I suspect that those of us who were already wary of the unbridled growth ambitions and vendor-like behavior of HIMSS – funded by our dues and our other HIMSS spending — aren’t going to like what’s coming. They’re still ignoring my request for copies of their 990 tax forms, which they’re required by law to provide, and that never happened under Steve Lieber. It’s last call for the HISsies nominations for 2018. Surely you have thoughts about the year’s stupidest vendor action, the most overrated technology or buzzword, and the industry figure with whom you’d like to have a few beers. ChartLogic parent company MedSphere will use $32 million in new financing for expansion efforts, including acquisitions and hiring. Sources say Apple has at least 50 doctors on staff across various projects, with some keeping their roles a secret in accord with company culture. Others have been given a bit more media leeway as the company looks to convince providers it is taking their data-overload and “worried well” concerns to heart. Apple’s consistent hiring of medical experts has pundits predicting that the company is getting serious about developing devices and apps that cater to the chronically ill. The company hasn’t mentioned what part, if any, of its second campus in Austin, TX will be used for healthcare projects. The $1 billion facility will house up to 15,000 employees on 133 acres. Evergreen Healthcare Partners names Beth Zuehlke (Healthfinch) SVP of consultant engagement. Henry Chao (Sparksoft) joins federal health IT vendor FEI Systems as CTO. Chao led the roll out of Healthcare.gov during his time as CMS CIO and deputy director. He published “Success or Failure? 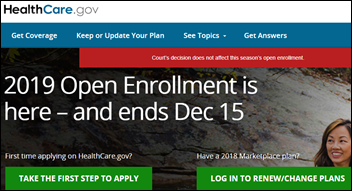 The Untold Story of HealthCare.gov” in September. New York-Presbyterian Hospital signs a 10-year agreement with Philips for its IntelliSpace Enterprise Edition informatics software. Beaumont Accountable Care Organization (MI) selects HealthEC’s population health management technology and services. WakeMed (NC) will deploy Goizio Health’s wayfinding and patient engagement app, which will include access to Epic’s MyChart. Chesapeake Regional Medical Center (VA) will equip its EMTs with Pulsara’s hospital notification app next month. 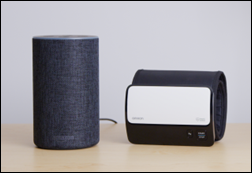 Amazon works with Omron Healthcare to develop a skill for Alexa that connects the virtual assistant to the vendor’s blood pressure monitor. Wake Forest Baptist Health’s Davie Medical Center (NC) implements Vocera’s clinical communication and workflow software as part of its surveillance monitoring efforts. A TransUnion Healthcare study finds that 80 percent of a hospital’s self-pay revenue comes from just 30 percent of self-pay accounts, an important figure as more people are losing health insurance and patient-responsible balances are increasing sharply. A previous study found that a typical hospital could boost their bottom line a lot more by optimizing their revenue cycle instead of cutting costs. 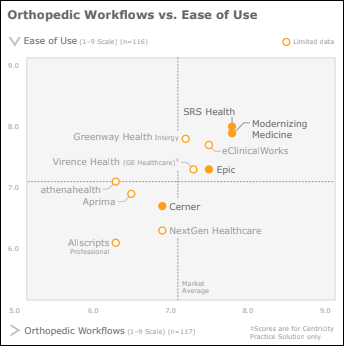 A new KLAS report on EHRs for orthopedic practices finds that SRS Health and Modernizing Medicine deliver the best workflows, Epic does well as an enterprise solution while Cerner is overwhelming to smaller facilities, and Allscripts Professional finishes last in lacking prebuilt orthopedics content. Skilled nursing provider Marquis Companies reports reducing hospital admissions by 60 percent in a pilot project with Collective Medical, which gives individual skilled nursing facilities instant notification when a resident seeks care at a local hospital so they can, under appropriate circumstances, be treated by the SNF instead. 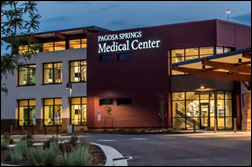 OCR fines Pagosa Springs Medical Center (CO) $111,000 for failing to cut off a former staffer’s access to a Web-based scheduling calendar that included PHI. HCA (TN) develops and promises to share its Sepsis Prediction and Optimization of Therapy (SPOT) software, which uses AI-powered algorithms to analyze patient data in real time to look for signs of an impending infection. According to HCA, SPOT is capable of diagnosing a patient 20 hours before a physician, increasing survival rates between 4 and 7 percent. Who do I call – my primary care physician, cardiologist, or 911? When do I confidently ignore, act upon, or wait to make actionable decisions about alerts I’ve received? What do I do if I don’t have a PCP or cardiologist and have to wait three to four weeks or months for a new patient appointment? What if my care team doesn’t use this wearable technology in their practice or recognize the value of the data that is generated? Does Apple have a national registry of physicians by zip code that I may call for a virtual consult? Cuero Community Hospital (TX) adds several FormFast solutions to its current implementation. The Allscripts Developer Program includes Healthfinch in its list of top nine apps for 2018. Halifax Health (FL) reports improved physician satisfaction and productivity, and patient care after implementing AI-powered documentation software from Nuance. Douglas Thompson (Advisory Board) joins The Chartis Group as principal. Collective Medical partners with the South Carolina Hospital Association, giving its members access to the company’s real-time, risk-adjusted, event notification and care collaboration tools. CMS announced an upcoming outage of the Open Payments system, in advance of the data submission for Program Year 2018. The system will be down January 3-6 and then again January 14-26. CMS notes that the outages “coincide with enhancements which will enable a better user experience,” but I suspect that they won’t be revolutionary enough to justify 17 days of downtime. I felt like a fish out of water in my practice this week, as my state’s Prescription Drug Monitoring Program database had some technical glitches. Apparently, connectivity issues impacted the accuracy of the dispensing data for the past week, leaving physicians wondering whether their patients had actually picked up controlled substances more than the website showed. It can be amazing how dependent we become on technology and how much we miss it when it’s not working. On the other hand, we rolled out some new technology that isn’t working quite as planned and it led to a great deal of aggravation. We switched online check-in platforms and it’s been difficult for both patients and staff to adjust. Our old platform was pretty basic, allowing a patient to provide demographic and insurance information along with a brief history. It also added the patients to a queue so we could bring them into the EHR when they arrived. The new platform promised much more functionality, including an “appointment time” so that patients can wait at home, avoiding other sick patients and remaining comfortable. However, we’re still trying to see patients quickly as they arrive and aren’t set up to hold an exam room for a patient with a pending appointment time. Despite the wording on the online check-in page, patients have been arriving at the office with the expectation that they’ll be seen at their appointment times. This has led to some friction at the front desks and to a couple of outright confrontations. We’ve been working with the vendor to see if we can change the nomenclature to something like “estimated visit time” or “estimated treatment time” rather than an “appointment time” but it doesn’t look like it can be done. 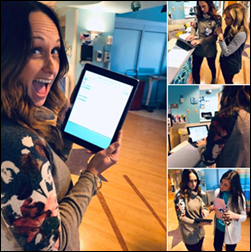 Our leadership is contemplating going back to the “virtual line” product, which happens to be integrated with our EHR. One of my partners asked about using a system like restaurants use, where a patient can leave the office and be paged when it’s their turn. I have mixed feelings about that approach for patients with infectious conditions. If they’re sick enough to be seen, they don’t need to be moving around the community or visiting retail locations adjacent to our offices. They’re also contemplating telehealth options, which could help to reduce congestion in the office. I’m personally excited about that option, as flu season makes me dread the inevitable upper respiratory infection I’ll get regardless of how much handwashing I do, and would reduce the number of sick people traveling around the community. We are told that innovation is the most important force in our economy, the one thing we must get right or be left behind. But the rear of missing out has led us to foolishly embrace the false trappings of innovation over truly innovative ideas that may be simpler and ultimately more effective. This mind-set equates innovation exclusively with invention and implies that if you just buy the new thing, voila! You have innovated. 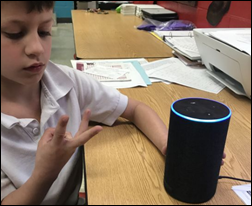 Each year businesses, institutions, and individuals run around like broken toy robots, trying to figure out their strategy for the latest buzzword promising salvation. 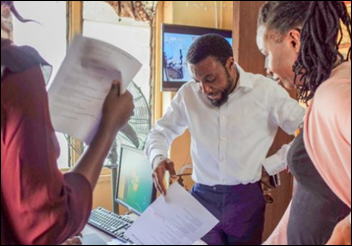 It is a continuing process of gradual improvement and assessment that every institution and business experiences in some way. Often that actually means adopting ideas and tools that already exist but make sense in a new context, or even returning to methods that worked in the past. Adapted to the challenges of today, these rearview innovations have proved to be as transformative as novel technologies. How many new technologies have hospitals partially implemented that might be revisited to ensure they deliver their additional promise or might be pushed to provide additional benefit for users? Can we glean additional return on our investment or find new uses for it? Are there ideas where some old-school thinking might be of benefit? The article mentions swings of the pendulum in urban planning and the return of previously marginalized solutions such as farmers’ markets. 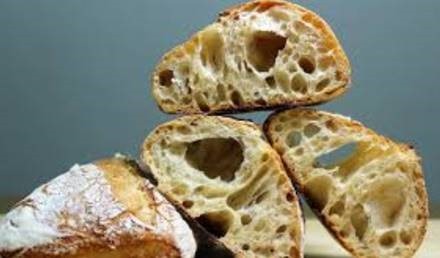 It mentions the rise of craft beer, heirloom vegetables, and artisan baking as ways that we are moving forward by looking back. There are plenty of problems that we can solve in healthcare that don’t require technology, and many organizations aren’t even thinking about them. At one large multi-state integrated delivery network, physicians aren’t allowed to delegate refill authority to trained staff even for routine maintenance medications for blood pressure or high cholesterol. Although there are some great systems out there to help with refills (healthfinch, anyone?) an organization first needs to decide that physicians should have support completing those types of routine tasks. Until they arrive at that point, it doesn’t matter what technology is available. The intersection of technology and policy made me want to scream this week. One of my clients recently changed their password security requirements. I’m wondering if I missed a new release from NIST because some of the requirements are directly contrary to what had been released earlier in 2018. This hospital has adopted some particularly onerous guidelines. Not only must the password include upper- and lower-case letters, it must also include numbers and special characters. They’ve also reinstituted time-based changes every 90 days. Passwords can’t be reused for at least a year. Worst of all, at least five of the eight required characters must be changed for every new password. NIST has said previously that requiring periodic changes and arbitrary complexity isn’t helpful for security and that it just frustrates users. 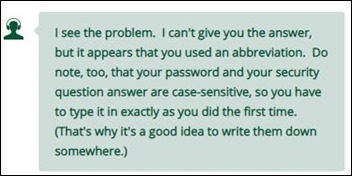 On the flipside, the helpful people at LL Bean recommended that I write down both my password and the answers to my security questions. If you’re a hacker looking to score some durable polo shirts or “wicked good” boots, have at it.